12 Cryptolist Easter words to decipher. Use the decoder at the top of puzzle to record letter substitutions. 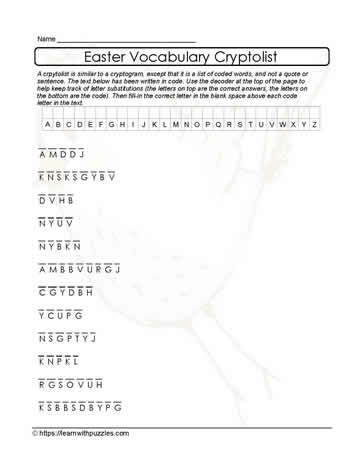 Students use knowledge of word structure, themed vocabulary, letter frequencies, to decrypt the alphabet code used in this cryptolist puzzle. Suits students in grades 4,5,6 classrooms, homeschooling, tutoring resources. Differentiate instruction for students in earlier grades and with ELLs in the classroom acquiring English.